Rotator cuff is a common name for the group of 4 distinct muscles and their tendons that provide strength and stability during motion of the shoulder. They are also referred to as the SITS muscle with reference to the first letter of their names (Supraspinatus,Infraspinatus,Teres minor, and Subscapularis). The muscles arise from the scapula and connect to the head of the humerus, forming a cuff at the glenohumeral joint. Cranial to the rotator cuff, there is a bursa that covers and protects the muscle tendons as they are in close contact to the surrounding bones. The rotator cuff muscles are each used in a variety of upper extremity movements including flexion, abduction, internal rotation and external rotation. They are essential players in almost every type of shoulder movement. Balanced strength and flexibility in each of the four muscles are vital to maintain functioning of the entire shoulder girdle. 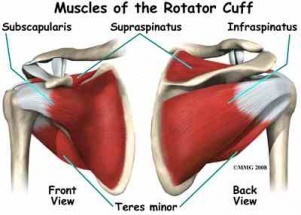 As a group, the rotator cuff muscles are responsible for stabilizing the shoulder joint. They keep the head of the humerus into the small glenoid fossa of the scapula in order to enlarge the range of motion in the glenohumeral joint and avoid mechanical obstruction. Rotator cuff injuries are common injuries that can occur at any age. In younger subjects, most injuries occur secondary to trauma or arise from overuse due to overhead activities (e.g. volleyball, tennis, pitching). Incidence of injuries increases with age, however some individuals with rotator cuff pathology may be asymptomatic. It is important to differentiate shoulder pain coming from places other than the shoulder, such as the neck or elbow and also pains from other structures at the shoulder, through anamnesis and physical examination. Pain is mostly provoked by overhead maneuvers and weakness of the shoulder muscles may occur. Rotator cuff muscles can not be seen on X-rays but calcifications, arthritis or bone deformations - that are common causes for rotator cuff pathologies - may be visible. The most common imaging method to evaluate rotator cuff pathologies is MRI. It can detect tears and inflammation and may help to determine size and character in order to establish a proper treatment protocol. Although, MRI is the gold standard imaging method for rotator cuff pathologies, US can be used as it has a good diagnostic accuracy (Evidence level 2a), more cost effective and readily available. ↑ Jia X, Petersen SA, Khosravi AH, Almareddi V, Pannirselvam V, McFarland EG. Examination of the shoulder: the past, the present, and the future. J Bone Joint Surg Am. 2009;91:10-8. ↑ Day, M, Phil, M, McCormack, RA, Nayyar, S, Jazrawi, L. Physician Training Ultrasound and Accuracy of Diagnosis in Rotator Cuff Tears. Bulletin of the hospital for joint disease(2013). 2016; 74(3):207-11.